On the landmark occasion of the proclamation of Addis Ababa as World Capital of Culture and Tourism and the opening of the Unity Trough Culture Festival in Ethiopia a top ranking delegation headed by H.E. Professor Dr. Anton Caragea was invited for a discovery tour of Ethiopia, for the opening of the Addis Ababa-World Capital of Culture and Tourism Festival and for a string of meetings destined to enhance the bilateral relations. On the invitation of H.E. Mrs. Sahle Work Zewde F.D.R Ethiopia President, H.E. Professor Dr. Anton Caragea had visited Ethiopia at the head of a high level delegation. The visit took place between 29 January through 8 February 2019 and included an important political and diplomatic dimension. H.E. Professor Dr. Anton Caragea gives the start of Addis Ababa Culture and Tourism Festival. The inclusive dialogue, concentrated on promoting bilateral trade, investment and economic cooperation, supporting business people and firms, from both regions, in cooperating and promoting the exchange of techniques, skills and economic goods. On diplomatic arena an ample cooperation and further developing of honorary consul’s network across the world, was established, with a view to foster tourism, cultural and economic cooperation. Creating a network of Ambassadors for Tourism and Culture, promoting tourism and the image of Ethiopia, where also tabled, based on other successful examples of actions carved by Institute of International Relations and Economic Cooperation. Opening the world tourism ceremony in Addis Ababa. On February 3, 2019 President Professor Dr. Anton Caragea presented the opening speech for World Capital of Culture and Tourism ceremonies for Addis Ababa. The world tourism ceremony included also folk dances, Ethiopian traditional coffee ceremony and academic presentations, supported by leading figures of Ethiopian cultural establishment. The ceremony was live broadcasted and viewed by more than 200 million television viewers and will continued to be presented across the world for the next year. H.E. Professor Dr. Anton Caragea receives an Ethiopian art work from the Head of Government in Addis Ababa. The visit included also a large cultural discovery programme carved specially to offer to Professor Dr. Anton Caragea delegation the opportunity to observe new areas and zones of Ethiopia different from 2015 visit. The cultural trip encompassed areas as Jimma and Kaffa provinces, from where the coffee cultivation started across the world, trade routes around Jimma province and imperial places across Gibe river ) mainly Abba Jifar Palace UNESCO heritage site), the natural volcanic area of lake Bishoftu and cultural and religious landscape of Debre Libanos Monastery. A special segment of the cultural programme was the discovery of Addis Ababa historical potential with stop-overs to Entoto Mountain Historical Site )with Emperor Menelik II Palace, Churches of Saint Maryam and Saint Raguel and Elie Church and Entoto Museum etc) Cathedrals of Holy Trinity (Haille Selassie) and Saint George and Museums of National History and Ethnographic Museum (hosted in former imperial palace Genet Leul) etc. Concluding the visit H.E. Professor Dr. Anton Caragea was invited for a return visit for September 2019 opening session of the new Ethiopian Parliament in order to give a boost to the country parliamentary structures and to promote the nation integration in global parliamentary structures. President Dr. Anton Caragea will open, at the head of a delegation composed of academicians, cultural and political life personalities, the celebrations for Africa Week of Culture and Tourism to be held in Addis Ababa from 6 to 8 February 2019. Addis Ababa is now a member of World Capitals of Culture and Tourism select list. Addis Ababa was selected as the first African mega-city to be inscribed on the world list of Capitals of Culture and Tourism in recognition of the city`s rich past, booming traditions and remarkable tourism development. Addis Ababa encompasses ten world heritage sites on tentative list ranging from natural treasures and natural protected areas such as: a vast array of historically and religiously monuments like the former imperial palace hosting today the Ethnographic Museum, the Entoto enclose of Emperor Menelik II and Empress Taytu , the cathedrals of Saint George, Holy Trinity, Medhame Alem –the largest cathedral in Ethiopia and the second in Africa etc. President Professor Dr. Anton Caragea welcomed to Ethiopia by Ethiopian H.E. Prime Minister Hailemariam Desalegn (during 2015 visit). The capital city: Addis Ababa is home to a treasure trove of architectural marvels appreciated in his statement Professor Dr. Anton Caragea. Our participation in Addis Ababa, World Capital of Culture and Tourism activities is part of our long-standing commitment to the development of Africa, stated Professor Dr. Anton Caragea, IRICE President. H.E. 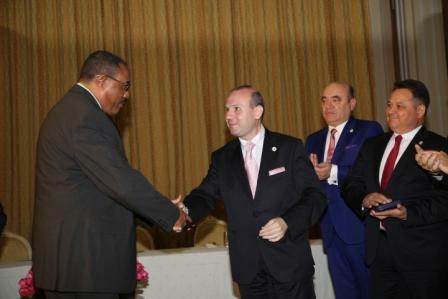 President Dr. Anton Caragea welcomed during his official trip to Djibouti by the H.E. President-Academician Ismail Omar Guelleh (April 2018 ). Plus Ethiopia is a long-standing diplomatic and dialogue partner and the 2015 visit has herald in a new era of cooperation and friendship stated IRICE President, Dr. Anton Caragea. Now that Ethiopia has elected a new governmental team it is the high time to discuss and express our long-term commitment of Ethiopia`s development and for our partnership. And the high level meeting on the programme will help to this end, concluded professor Dr. Anton Caragea. President of Zimbabwe H.E. 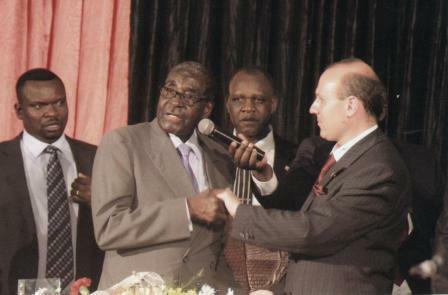 Robert G. Mugabe welcomes President Professor Dr. Anton Caragea in Zimbabwe`s capital Harare. We have supported development and cultural programs in Djibouti, Ethiopia and Zimbabwe and we are proudly adding now Addis Ababa to our list of valuable partners in the region and the support and enlighten policies of Eng. Takele Uma Benti are a guarantee for a long-term cooperation concluded President Dr. Anton Caragea. The list of meetings for presidential delegation include: Head of Addis Ababa`s government Takele Uma Benti and President of F.D.R. of Ethiopia Mrs. Sahle Work Zewde. The delegation headed by H.E. 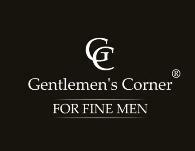 Professor Dr. Anton Caragea will have extensive dialogues with H.E. Eng. Takele Uma Benti Ministers of Tourism, of Culture and of Foreign Affairs and a special meeting with H.E. Academician Sahle Work Zewde, President of Ethiopia and will benefit from a cultural and orientation programme in the country. The cultural programme will encompass visits to Bahir Dar, discovery of famed Lake Tana`s Monasteries (legendary home of the Ark of Covenant), familiarization trip to province of Kaffa (home to first coffee) and a visit to Jimma, the famous capital of Abba Jifar empire and will conclude with the ceremonies to open the cultural and tourism week celebrations in Addis Ababa. In data de 30 iulie 2018, Profesor Dr. Anton Caragea, in calitatea sa de lider al echipei de observatori internationali pentru alegerile din Cambodgia, a prezentat raportul de evaluare a alegerilor, urmand ca raportul final sa fie facut public, impreuna cu recomandarile necesare, la finalul lunii august 2018. Profesor Dr. Anton Caragea, liderul grupului de observatori electorali internationali prezinta raportul de monitorizare Primului Ministru al Cambodgiei Academician Hun Sen.
Raportul de monitorizare electorala a fost prezentat in fata guvernului regal al Cambodgiei, condus de Primul Ministru Academician Hun Sen, a reprezentantilor parlamentului, ai Comisiei Nationale Electorale si a reprezentantilor partidelor ce au luat parte la scrutinul din 29 iulie 2018, precum si in prezenta corpului diplomatic acreditat la Phnom Penh. Scrutinul din 29 iulie din Cambodgia a fost supervizat de peste 160.000 de observatori electorali nationali si internationali din peste 56 de state ale lumii. Profesor Dr. Anton Caragea a prezentat pe rand: raportul preliminar de monitorizare a conditiilor pre-electorale ce a luat in clacul situatia legala, desfasurarea perioadei de campanie electorala si pregatirile pre-scrutin si apoi a prezentat situatia desfasurarii scrutinului in ziua alegerilor din 29 iulie 2018. Raportul din 30 iulie 2018 a constatat pe baza primelor rezultate si a situatiei general raportate ca alegerile din Cambodgia sau desfasurat in mod clar in mod liber, democratic si echidistant. Profesor Dr. Anton Caragea a prezentat in mod oficial mesajul de felicitare pentru victoria inregistrata de Primul Ministru al Cambodgiei, Academician Hun Sen, in cadrul alegerilor legislative ce au avut loc in aceasta tara in data de 29 iulie 2018. Presedintele IRICE, Profesor Dr. Anton Caragea este primul lider ce adreseaza felicitari castigatorului indiscutabil al alegerilor democratice din Cambodgia, Primul Ministru Hun Sen. In dialogul sau cu Primul Ministru al Regatului Cambodgiei, Presedintele IRICE, Profesor Dr. Anton Caragea a marcat ca victoria clara, in alegeri libere, democratice si transparente a Partidului Poporului Cambodgian condus de Primul Ministru Hun Sen ii ofera acestuia un mandat popular si o legitimitate democratica ce trebuie folosite pentru a reforma societatea, a impulsiona economia si a permite societatii cambodgiene sa se bucure de roadele dezvoltarii economice fara egal din ultimele decenii. Prezentarea de catre Televiziunea din Cambodgia a intalnirii dintre Prof. Dr. Anton Caragea si Primul Ministru Hun Sen.
Primul Ministru Hun Sen a multumit Presedintelui Prof.dr. Anton Caragea pentru eforturile sale in consolidarea si recunoasterea statului de drept si a democratiei in Cambodgia si a marcat ca este convins ca si in anii ce vor urma poporul cambodgian va putea sa se bazeze pe un prieten si partener in Prof. Dr. Anton Caragea. Conform Agentiei Cambodgiene de Presa mesajul prof.dr. Anton Caragea a fost primul mesaj de felicitare sosit fiind urmat apoi de mesajele Presedintelui R.P. China-Xi Jinping, al Primului Ministru al Chinei si apoi de mesajele Primului Minstru din Laos, Vietnam, Thailanda si al regelui Brunei-ului etc. Peste 30 de lideri au adresat in zilele ce au urmat alegerilor mesaje de felicitari pentru alegerile democratice din Cambodgia 2018. In prima zi a vizitei oficiale in Djibouti, Presedintele Dr. Anton Caragea a avut o intrevedere amicala cu Presedintele Djibouti: Academician Ismail Omar Guelleh. Dialog al prieteniei intre Presedintele Djibouti, Academician Ismail Omar Guelleh si Presedinte Prof. Dr. Anton Caragea. Academician Ismail Omar Guelleh a exprimat multumiri oficiale din partea guvernului si poporului din Djibouti pentru vizita pe care Prof. Dr. Anton Caragea o efectueza in tara din Cornul Africii si pentru intregul sprijin acordat in domeniul diplomatic, turistic si cultural pentru afirmarea statului Djibouti in plan mondial. La randul sau Prof. Dr. Anton Caragea a exprimat, in numele delegatiei sosite in Djibouti, intreaga sa gratitudine pentru primirea exceptionala si plina de caladura si pentru organizarea perfecta a sarbatorilor Saptamanii Culturii si Turismului African in Djibouti. Primul Ministru al Djibouti E.S. Abdoulkader Kamil Mohamed i-a inmanat intr-o ceremonie publica ORDINUL NATIONAL 27 IUNIE in grad de comandor E.S. Prof.Dr. Anton Caragea. Djibouti devine nu doar un centru de neocolit pentru marile afaceri, pentru comertul international si pentru instalarea de puncte strategice si baze militare ce ofera securitate pentru intreaga regiune, dar si o zona de cultura, de respect pentru traditie si de o bogatie naturala ce poate fi exploatata in beneficial dezvoltarii turismului a precizat Presedinte Dr. Anton Caragea. La finalul intalnirii la ordinele E.S. Presedintele Republicii Djibouti-Acad. Ismail Omar Guelleh, Primul Ministru al Djibouti E.S. Abdoulkader Kamil Mohamed i-a inmanat intr-o ceremonie publica ORDINUL NATIONAL 27 IUNIE in grad de comandor E.S. Prof.Dr. Anton Caragea. 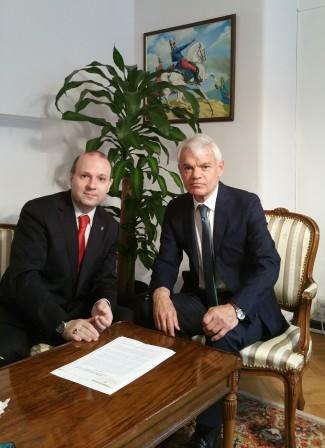 Aceasta recunoastere vine ca rezultat al eforturilor de o viata ale Presedintelui Prof. Dr. Anton Caragea in dezvoltarea unei diplomatii a secolului XXI,in construirea de punti de cultura si turism intre natiuni, in promovarea democratiei si a libertatii, in apararea pacii in plan mondial, a declarat E.S. Abdoulkader Kamil Mohamed, Primul Ministru al Djibouti. 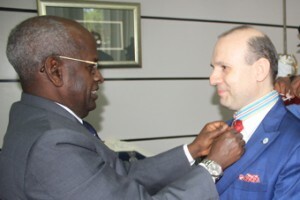 Ceremonia de decorare a avut loc in prezenta Guvernului Djibouti a membrilor parlamentului si Presedintiei si a fost transmisa in direct la televiziune. Water is life. Without water there can be no life. The world’s freshwater supplies, unfortunately, are under threat. Water stress is increasing in many parts of the world. Aquifers are depleted faster than they are replenished. The growth of the world’s population will increase demand for water by 55% by the year 2050, placing even further strain on freshwater reserves. Rivers are the arteries of the earth. Seen from above, the earth’s creeks, lakes, rivers and wetlands form natural networks which sustain nature. Rivers and lakes account for 90% of the world’s freshwater stocks. Rivers have been the cradles of human civilization from time immemorial. The earliest civilizations were nurtured along the banks of rivers – including the Euphrates, the Indus, the Nile and Yellow rivers. The adverse effects of climate change – droughts, flooding, rising sea levels and extreme weather events – are exacerbating water quality and environmental security. The Inter-governmental Panel on Climate Change (IPCC) has forecasted that climate change will result in reduced surface and ground water in most sub-tropical regions. World Water Day reminds us of our shared responsibility to protect the earth’s water resources. WE have, therefore, calls on this World Water Day to take action to protect water for future generations. At stake is nothing less than humanity itself. I wish success to the celebrations marking World Water Day. Presedintele Dr. Anton Caragea va participa impreuna cu Presedintele Ismail Omar Guelleh la sarbatorile Saptamanii Culturii si Turismului in Africa, ceremonii ce vor avea loc intre 16 si 22 aprilie 2018 in Djibouti. Djibouti este noua Capitala Mondiala a Culturii si Turismului. Djibouti este primul oras din Africa care a fost inscris in lista Capitalelor Culturii si Turismului in meritata recunoastere a trecutului bogat al orasului, al exuberantei traditiilor si a dezvoltarii remarcabile a turismului. Djibouti beneficiaza de zece monumente parte a patrimoniului mondial al umanitatii printre ele arii naturale protejate precum: Lacul Assal si lacul Abbe, Parcul National: Foret du Day, tumulii de la Wellos si picturile rupestre de la Abourma. Presedinte Profesor Dr. Anton Caragea in vizita oficiala in Etiopia intampinat de Primul Ministru etiopian E.S. Hailemariam Desalegn. Capitala Djibouti este la randul ei inobilata cu minuni arhitecturale precum: Moscheea Haji Hamoudi, cartierul european (Piata Malik), cartierul African (Piata Rimbaud), catedrala din Djibouti si Biserica etiopiana Sf. Gabriel al Soarelui si incredibilul spatiu de diversitate culturala de la Les Caisses. Participarea noastra la evenimentele derulate in jurul numirii orasului Djibouti drept Capitala Mondiala a Culturii si Turismului este parte a indelungatei noastre legaturi cu Africa si cu dezvoltarea acesteia, a subliniat Profesor Dr. Anton Caragea, Presedintele Institutului de Relatii Internationale si Cooperare Economica (IRICE). Am sprijinit programe de dezvoltare economica si culturala in Etiopia si in Zimbabwe si acum adaugam cu mandrie Djibouti pe lista noastra de parteneriate in regiune, iar sprijinul pentru dezvoltare si politicile energice de crestere economica puse in practica de catre Academician Ismail Omar Guelleh, Presedintele Republicii Djibouti sunt a garantie a unei cooperari indelungate, a mai mentionat Presedintele Dr. Anton Caragea. E.S. Academician Ismail Omar Guelleh, Presedintele Republicii Djibouti este creatorul unui model de dezvoltare apreciat de intreaga lume. Delegatia condusa de E.S. Profesor Dr. Anton Caragea va avea o serie de dialoguri cu E.S. Abdoulkader Kamil Mohamed, Primul Ministru al Djibouti, E.S. Mahmoud Ali Youssef , Ministrul Afacerilor Externe si al Cooperarii Internationale si o intrevedere speciala cu E.S. Academician Ismail Omar Guelleh, Presedintele Republicii Djibouti si va beneficia de un program cultural si de familiarizare special in cadrul vizitei. President Dr. Anton Caragea will open, together with President Ismail Omar Guelleh, the celebrations for Africa Week of Culture and Tourism to be held in Djibouti from 16 to 22 April 2018. Djibouti is now a member of World Capitals of Culture and Tourism select list. Djibouti was selected as the first African city to be inscribed on the world list of Capitals of Culture and Tourism in recognition of the city rich past, booming traditions and remarkable tourism development. The country encompasses ten world heritage sites on tentative list ranging from natural treasures and natural protected areas such as: Lake Assal and Lake Abbe, National Park Foret du day to the tumulus of Awellos, cave paintings of Abourma. President Professor Dr. Anton Caragea welcomed to Ethiopia by Ethiopian H.E. Prime Minister Hailemariam Desalegn. 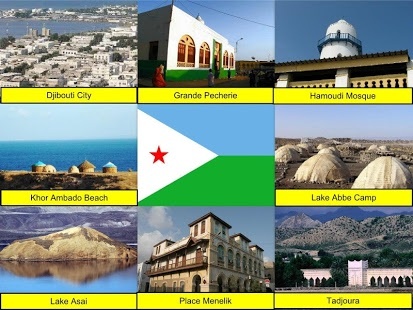 The capital city: Djibouti is home to a treasure trove of architectural marvels from the historical Haji Hamoudi Mosque, European Quarter (Malik Square) and African Quarter, Djibouti Cathedral and Ethiopian Church Saint Gabriel of the Sun and the cultural blending space of Les Caisses etc. Our participation in Djibouti, World Capital of Culture and Tourism activities is part of our long-standing commitment to the development of Africa, stated Professor Dr. Anton Caragea, IRICE President. We have supported development and cultural programs in Ethiopia and Zimbabwe and we are proudly adding now Djibouti to our list of valuable partners in the region and the support and enlighten policies of Academician Ismail Omar Guelleh, President of Djibouti are a guarantee for a long-term cooperation concluded President Dr. Anton Caragea. H.E. Academician Ismail Omar Guelleh, President of Djibouti is a world recognized leader appreciated for his ambitious development model enacted in Djibouti. The delegation headed by H.E. Professor Dr. Anton Caragea will have extensive dialogues with H.E. Mr. Abdoulkader Kamil Mohamed, Prime Minister of Djibouti, H.E. Mr. Mahmoud Ali Youssef, Minister of Foreign Affairs and a special meeting with H.E. Academician Ismail Omar Guelleh, President of Djibouti and will benefit from a cultural and orientation program in the country. The relations between Romania and Venezuela are registering a brisk growth in the last span of time with the height registered on the occasion of the official visit of the Romanian delegation to Caracas. The visit took place between 15 to 22 September 2017 and was covering a historical gap in the bilateral relations with the latest official visit taken place in 1994. Solidarity and friendship in a handshake: H.E. Nicolas Maduro, President of Venezuela and the architect of Bolivarian diplomacy and H.E. Professor Dr. Anton Caragea , President of Institute of International Relations and Economic Cooperation. Professor Dr. Anton Caragea, IRICE President remarked: Romania and Venezuela are having a shared history of fighting for democracy and freedom, they have the same stances in rejecting interference in internal affairs, promoting respect for national sovereignty and independence as pillars of international affairs and rejecting any form of threat of war and sanctions as contrary to international law. Professor Dr. Anton Caragea hosted in MIRAFORES TV studios and National Venezuelan Television. During the week-long visit, the high-level Romanian delegates hold extensive talks with various officials like: Juan Bautista Arias Palacio – Minister for Basic and Strategic Industries and Socialist Development, Minister for Communications and Information and Minister of Tourism. Professor Dr. Anton Caragea receives for discussions at Hotel Alba the Vice-Minister of Tourism of Venezuela. Agreements regarding economic cooperation, bilateral information exchange and cooperation for SDG completion in the framework of Parliamentary Assembly for Sustainable Development Goals where tabled. Cooperation in the field of tourism promotion and Romanian support for Caracas election as World Capital of Culture and Tourism was also agreed. 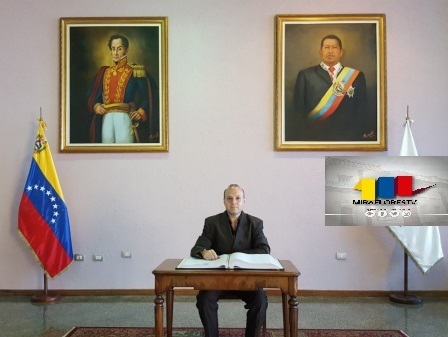 Professor Dr. Anton Caragea in a moment of respect in front of the Commander HUGO CHAVEZ Mausoleum in Mountain Quarter (Quartel de la Montana). The Romanian delegation visit to Venezuela has given a new impetus to the relations between nations and their attendance to the world solidarity movement with Venezuela has being registered with gratitude by the people of the Caribbean nation, proudly building a revolution of freedom and dignity. President Nicolas Maduro is addressing a crowd of over one million supporters on the streets of Caracas: Venezuela will win! 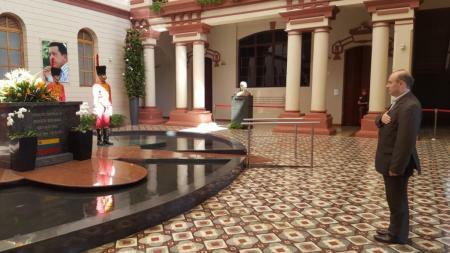 MIRAFLORES Presidential Palace: the beating heart of Bolivarian revolution! Caracas se convertirá en la capital diplomática oficial mundial con ocasión del Día Internacional de la Diálogo por la Paz, la Soberanía y Diplomacia Bolivariana proclamado por el Presidente Nicolás Maduro de Venezuela. El convocatorio del Presidente Nicolas Maduro para el Día Internacional de la Diálogo por la Paz, la Soberanía y la Diplomacia Bolivariana a unido el mundo en un movimiento global líderada de Caracas por la paz y la democracia. El Día Internacional de la Paz, la Soberanía y la Diplomacia Bolivariana es una creación del Presidente Nicolás Maduro, parte de los esfuerzos de la diplomacia bolivariana generalmente aclamados, destinados a construir una diplomacia para el pueblo, orientada hacia la cooperación sin confrontación, la independencia sin usurpación y el diálogo para paz. De acuerdo con el papel de Caracas como una tribuna diplomática global y multipolar, en el Día Internacional de la Paz, la Soberanía y la Diplomacia Bolivariana -La solidaridad con Venezuela van a asistar líderes alrededor del mundo interesados ​​en elaborar la agenda para un siglo XXI sin agresión, estratagemas imperialistas, amenazas y conflictos. Profesor Dr. Anton Caragea, Presidente Director General del Instituto de Relaciones Internacionales y Cooperación Económica (IRICE) va a presentar su posicion en el cumbre mundial de Caracas. Rumania participará plenamente en el evento con una delegación a cargo del Profesor Dr. Anton Caragea, Presidente Director General del Instituto de Relaciones Internacionales y Cooperación Económica (IRICE). Jorge Arreaza Montserrat, El Ministro de Relaciones Exteriores de Venezuela logró a fructificar la visión del Presidente Maduro para transmitir al mundo un poderoso mensaje: ¡TODOS SOMOS VENEZUELA! Jorge Arreaza Montserrat, El Ministro de Relaciones Exteriores de Venezuela ha señalado en la carta de invitación oficial dirigida al Prof. Dr. Anton Caragea: Como Ministro de Poder Popular para Relaciones Internacionales, considero con interés su participación en este espacio de magnitud y su solidaridad en este momento histórico en que celebramos el legado de dignidad y justicia del Comandante Hugo Chávez y del Presidente Nicolás Maduro legado al pueblo venezolano ya la revolución bolivariana. Antes de su viaje diplomatico a Venezuela, el presidente de IRICE, Anton Caragea, expuso su visión en relación con la reunión diplomática más importante de 2017. Nuestra presencia en el evento de solidaridad diplomática y mundial con la Revolución Bolivariana de Venezuela está grabada como un poderoso símbolo de nuestro compromiso con la lucha por la libertad, la dignidad y la soberanía del pueblo venezolano bajo el liderazgo sin igual del gobierno bolivariano y la abnegada dedicación del presidente Maduro. ¡La libertad vencerá siempre! esta es la poderosa verdad que la gente de Venezuela y el presidente Maduro están presentando al mundo reunidos en Caracas. En el mundo de hoy Venezuela se ha convertido en un vibrante ejemplo de democracia participativa, esfuerzos prominentes para América Latina y la independencia global y el respeto por el estado y la independencia nacional, afirmó el profesor Anton Caragea. Caracas acoge una gigantesca manifestación de vitalidad de las personalidades amorosas de la democracia, todas unidas bajo un solo grito destinado a ser escuchado en todo el mundo: ¡La libertad vencerá siempre! On 16 and 17 September 2017 the city of Caracas is playing host to a giant manifestation of vitality of democracy garering global personalities all united under one banner destined to be seen worldwide: Freedom will prevail! Professor Dr. Anton Caragea, President Director General of Institute of International Relations and Economic Cooperation (IRICE) will outline his vision on world summit in Caracas (16-17 September 2017). Romania will participate fully on the event with a delegation led by Professor Dr. Anton Caragea, President Director General of Institute of International Relations and Economic Cooperation (IRICE) in attendance. 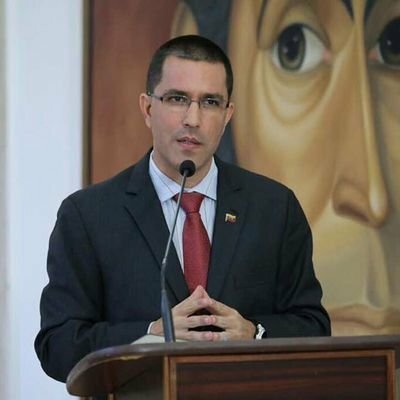 Jorge Arreaza Montserrat, The Minister of Foreign Affairs of Venezuela succeded in fruition of President Maduro vision to carve out a powerful message: WE ARE ALL VENEZUELA! Jorge Arreaza Montserrat, The Minister of Foreign Affairs of Venezuela has marked in the official invitation letter addressed to Professor Dr. Anton Caragea: As the Minister of People Power for International Relations I consider with interest your participation in this space of magnitude importance and your solidarity in this historical moment when we celebrated the legacy of dignity and justice of Comandante Hugo Chavez and of President Nicolas Maduro bequeathed to the Venezuelan people and to the Bolivarian revolution. Before the departure to Venezuela the IRICE President Anton Caragea outlined his vision in relation with the most significant diplomatic meeting of 2017. In the world of today Venezuela has become a vibrant example of participatory democracy, prominent exertions for Latin America and global independence and respect for the statehood and national independence, stated Professor Dr. Anton Caragea. The international Campaign for the implementation of 2030 Agenda of United Nations, known worldwide as SUSTAINABLE DEVELOPMENT GOALS AGENDA, in the work of parliaments across the world has reached a first milestone, only after a year of existence, with the support of 250 parliamentarians from 20 national parliaments. Now with this threshold passed, the Parliamentary Assembly for SDG`s, is now endorsed across party lines, ideologies and national agenda`s by more than 250 current members of parliament from over 20 countries. The new logo of a Parliamentary Assembly for Sustainable Development Goals unveiled by the Assembly Executive President. The creation of a Parliamentary Assembly for SDG`s in the UN framework for world cooperation in the implementation of Sustainable Development Goals that was signed by the lawmakers calls for "a gradual implementation of Sustainable Development Goals in all national and local parliaments and elected assemblies agenda creating a global synergy for world level campaign aimed at bringing to life the SUSTAINABLE DEVELOPMENT GOALS AGENDA." 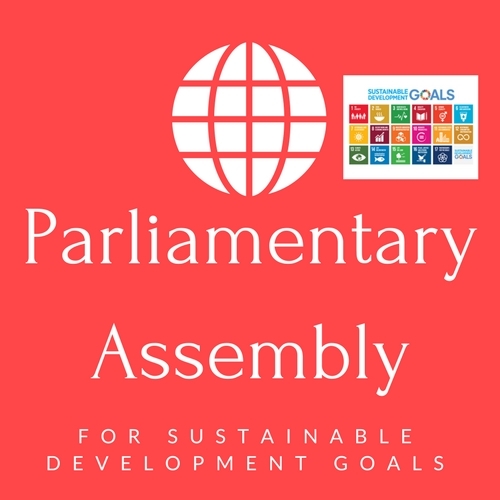 The role of Parliamentary Assembly for SDG`s is "to ensure international cooperation, secure the acceptance and to enhance the legitimacy of the United Nations SUSTAINABLE DEVELOPMENT GOALS AGENDA and strengthen the elected representatives ( parliamentarians) capacity to act and to be more effectively and directly included into the activities of implementing and financing the programs related to SUSTAINABLE DEVELOPMENT GOALS AGENDA." "This is an important milestone," remarked Professor Dr. Anton Caragea, the Parliamentary Assembly for SDG`s Executive President and campaign's coordinator. "The support of a UN Parliamentary Assembly for SDG`s by such a broad group of parliamentarians from all the world's regions shows once again that it is high time for the SUSTAINABLE DEVELOPMENT GOALS AGENDA to be recognized as paramount for world development," he concluded. "If it comes to democratizing the SUSTAINABLE DEVELOPMENT GOALS AGENDA and to insure global cooperation, than the Parliamentary Assembly for SDG`s is the venue for a technical and democratic debate, said Professor Dr. Anton Caragea. "The SUSTAINABLE DEVELOPMENT GOALS AGENDA would benefit from involving elected representatives in its deliberations. After all, in many cases it's them who are needed to help implement UN policy at the national level, especially if it comes to the Agenda 2030," said Mr. Catalin Nechifor from Parliamentary Assembly for SDG`s. Institute of International Relations and European Cooperation had created and pioneered the PARLIAMENTARY ASSEMBLY FOR SUSTAINABLE DEVELOPMENT GOALS SDG`s uniting world parliaments in the efforts to implement in their work and legislation measures dedicated to bring to life SDG in every nation. Institute of International Relations and European Cooperation is the second world academy that is offering SDG based courses and curriculum based on role of culture and development in carving a new and better future for as all. The Institute of International Relations and Economic Cooperation (IRICE) hosted the presentation and public signature of the United Nations Open Letter to Academic Institutions: Educate Future Managers and Leaders on Business and Human Rights. The ceremony has taken place on July 14, 2017 and the letter was publicly signed by The IRICE President, Professor Dr. Anton Caragea. This letter was drafted jointly by the UN Global Compact Office and the Secretariat of the UN Principles for Responsible Management Education (PRME) and was addressed for public endorsement by world leaders. We must underline that Romania by the relentless efforts of Professor Dr. Anton Caragea has become an educational leader at world level by placing at the fore an educational system directed towards the full implementation of Sustainable Development Goals. 3) have been exposed to best practices for managing the human rights impacts of business. Natiunile Unite prin vocea Presedintelui Adunarii Generale a Natiunilor Unite, Ambasador Peter Thomson, au adresat o Scrisoare principalilor lideri mondiali pentru a influenta comunitatea mondiala in vederea accelerarii procesului de implementare a OBIECTIVELOR DE DEZVOLTARE DURABILA (SDG) in plan regional si global. Scrisoarea a fost adresata unui numar de 190 de lideri globali dintre care in Romania a fost directionata catre Prof. Dr. Anton Caragea, Presedintele IRICE. Reamintim ca sub conducerea Prof. Dr. Anton Caragea, Institutul de Relatii Internationale si Cooperare Economica (IRICE) a devenit parte a OBIECTIVELOR DE DEZVOLTARE ALE MILENIULUI (MDG), a inaugurat cursurile speciale pentru lideri implicati in indeplinirea Obiectivelor de Dezvoltare Durabila si a devenit institutie organizatoare a ADUNARII PARLAMENTARE pentru OBIECTIVELE DE DEZVOLTARE DURABILA (SDG). Presedintele Adunarii Generale a ONU, Ambasadorul Peter Thomson a adresat o scrisoare celor 190 de lideri ai umanitatii, solicitand un impuls pentru o mai buna cunoastere si acceptare a Obiectivelor de Dezvoltare Durabila. Tot ceea ce am invatat in calitate de Presedinte al Adunarii Generale a ONU m-a dus la convingerea ca Acordul asupra Climei de la Paris impreuna cu Agenda 2030 pentru OBIECTIVELE DE DEZVOLTARE DURABILA (SDG) ofera umanitatii cea mai buna sansa pentru a construi un mod de viata sustenabil pentru toate speciile planetei. In urmarirea acestui obiectiv Va scriu Dumneavoastra si fiecarui sef de guvern din statele membre ale Natiunilor Unite pentru a va solicita sprijinul in educarea tinerei generatii pentru indeplinirea OBIECTIVELOR DE DEZVOLTARE DURABILA (SDG). Daca fiecare institutie educationala din aceasta lume va incorpora OBIECTIVELE DE DEZVOLTARE DURABILA (SDG) si fiecare scoala si fiecare tanar de pe aceasta planeta este informat si constientizeaza drepturile si responsabilitatile sale atunci lumea are o sansa solida pentru a indeplinii OBIECTIVELE DE DEZVOLTARE DURABILA (SDG) pana in 2030. Imi face o deosebita placere Excelenta Voastra sa va ofer si o serie de instrumente utile in prezentarea OBIECTIVELOR DE DEZVOLTARE DURABILA (SDG precum Parteneriatul Global pentru Educatie si Cea mai Importanta Lectie din Lume”. Mai multe despre ADUNAREA PARLAMENTARA pentru OBIECTIVELE DE DEZVOLTARE DURABILA (SDG) gasiti aici. The OFFICE OF THE PRESIDENT OF INSTITUTE OF INTERNATIONAL RELATIONS AND ECONOMIC COOPERATION OF ROMANIA (IRICE) has made public the United Nations General Assembly President letter calling on world leaders support for the global implementation of Sustainable Development Goals. President of United Nations General Assembly, Ambassador Peter Thomson had addressed a letter to the head of states and global leaders urging a better knowledge and acceptance of Sustainable Development Goals. The letter addressed to 190 world leader`s and global influencer`s among them Professor Dr. Anton Caragea, IRICE President calls for world level re-enforced cooperation agreement to the implementation of SDG and had come as a result of a general appeal from UN General Assembly President. On April 19, 2017 H.E. President of United Nations General Assembly, Ambassador Peter Thomson had addressed a letter to the head of states and global leaders urging a better knowledge and acceptance of Sustainable Development Goals in the world and asking a universal effort for the implementation of SDG in learning process across the world. Everything I have learned as President of the United Nations General Assembly has convinced me that, taken together with the Paris Climate Agreement, the 2030 Sustainable Development Agenda provides humanity with the best chance we have to shape a sustainable way of life for our species upon this planet. The Institute of International Relations and European Cooperation has being from the start of Sustainable Development Goals inception and promotions, alongside the global efforts made to implement SDG in the life of every man, woman and child on this planet. On 18 November 2016 the official visit, marking the opening of Autumn 2016-Romania Tourism Fair at the ROMEXPO Hall, in Bucharest, has taken place. Bread and Salt: Traditional welcome for H.E. Professor Dr. Anton Caragea-President General Director of Institute of International Relations and Economic Cooperation and Academician Mircea Constantinescu opening the 2016 TOURISM FAIR. The 18 November official tour of the exhibition had taken place under The High Patronage of President of Institute of International Relations and Economic Cooperation of Romania. On this occasion Professor Dr. Anton Caragea-President General Director of Institute of International Relations and Economic Cooperation has made the official tour of honour for all the pavilions that promoted outbound and inbound tourism, accompanied by a delegation of members of Romanian Parliament and the usual retinue of governmental officials. The Romanian Tourism Fair has garnered the most important tourism companies that outlined special offers for the lovers of cultural tourism, medical tourism and wellness, rural and business related tourism but also presented offers for aficionados of cruises, exotic destinations and adventure tourism. Professor Dr. Anton Caragea had toured the areas dedicated to the promotion of wine tourism and stressed his office support for wine discovery based tourism programs, that are allowing visitors to familiarized themselves with Romania`s natural beauties but also to taste the incredible Romanians wines. H.E. Professor Dr. Anton Caragea and IRICE delegates are admiring traditional dances from Bucovina. On the pavilions acknowledged by Professor Dr. Anton Caragea, IRICE President and Global Ambassador for Tourism we can count the COTNARI stand that promoted not only the perfection of Cotnari Wines but also Cotnari region as the heartland of Moldova`s tourism. Professor Dr. Anton Caragea visited the Photographic Exhibition ans encouraged the artists present and was received as distinguished guest by the representatives of the transport companies like Air Berlin, Blue Air and made a special stop over to the National Air Transport Company TAROM, where IRICE President took his time and attended a photo session with the employees of the national air company. The open conference held by Professor Dr. Anton Caragea on Middle Eastern tourism opportunities was attended by tourism specialists, mass media and governmental officials. Romanian Tourism Fair 2016 was a pleasant opportunity to meet the representatives of the tourism and air transport companies and to discuss new methods to improve tourism at world level and more than everything provided us with a rostrum of discussions for the future elections on WORLD BEST TOURISM DESTINATION FOR 2017 and WORLD CAPITAL OF CULTURE AND TOURISM IN 2017 stated IRICE President Professor Dr. Anton Caragea in the concluding remarks of his visit. 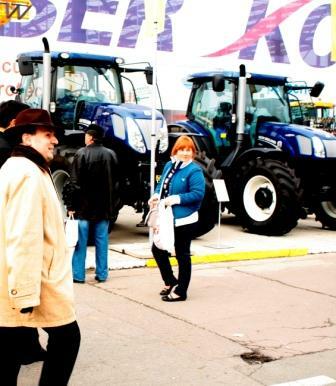 On 29 October 2016 at the ROMEXPO Hall in Bucharest, the opening ceremony of Food and Agriculture Exhibition has taken place. Professor Dr. Anton Caragea, MA, FNS, EDA and Romanian Parliament members lead by Senator Ionel Agrigoroaei are starting their tour with a visit to HOUSE OF PANCIU (Casa Panciu)official diplomatic partner. 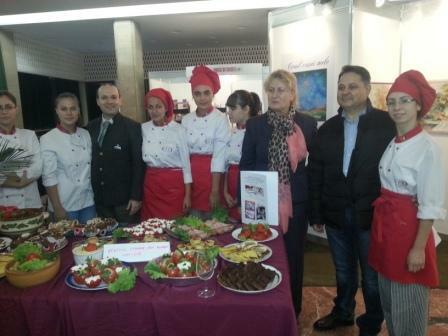 The exhibition had taken place in the period between 28 to 30 October 2016 and was held under The High Patronage of President of Institute of International Relations and Economic Cooperation of Romania and was convened to coincide with the celebration of WORLD FOOD DAY 2016. On this occasion, Professor Dr. Anton Caragea-President General Director of Institute of International Relations and Economic Cooperation has opened the exhibition and visited the established pavilions accompanied by a delegation of members of Romanian Parliament, lead by the Senate leader of activity Senator Ionel Agrigoroaei and a retinue of governmental officials. Opening the food and wine show, IRICE President, Professor Dr. Anton Caragea had delivered the official remarks for WORLD FOOD DAY 2016. Professor Dr. Anton Caragea surrounded with love and respect by the students and professors of Agricultural High School-future agricultural specialists of Romania. Today 2016 Agricultural and Food Exhibition is devoted to provide the image of the enormous potential and the endless possibilities of family farming in providing food security, development opportunities and a better future for collectivities across the world. (…) international food organizations are emphasizing the family farming as the core on which our future food and nutrition security pivots. This is even more real in Romania`s case where 85% of the agriculture output comes from family farming and in our declining economy only the agriculture is the main center of our financial resilience. When we are looking at this plenitude of food and richness of agricultural produces we must remember that food insecurity is still a plague for more than 1 billion people’s and the achievement of Zero Hunger Goal is still far a way as we have registered a number of 805 million food insecure people’s and 162 million chronically malnourished children. Our efforts as World Ambassador and our activities in the Parliamentary Assembly for Sustainable Development Goals are directed to doing just that. Our High Office will continue partnering with the private sector, civil society, all our UN partners, the governments where we serve, but most importantly with the people. 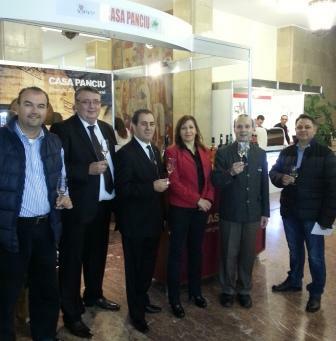 After the exhibition being declared officially opened the delegates toured the exhibition and made the first lay over at the place chosen by Senator Ionel Agrigoroaei, the stand of Casa Panciu (House of Panciu) the creator of Romanian Diplomatic Wine for 2016. The Romanian researchers are a pride for our country say`s Professor Dr. Anton Caragea in his visit to Pietroasele Wine Research Institute. 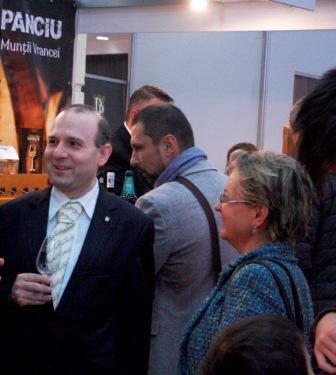 Casa Panciu had presented on the opening of National Wine Salon a selection of the best wines of 2014/2016: the Muscat Ottonel sweet wine, which had conquered the public with his pungent aroma, fine pearled image and the apple and fruity dominated taste a wine nearing perfection and marked with 94 points out of 100 for the citrus flavor. Amongst other new wines presented where: the Rose Wine of House of Panciu that completed the initial success of the Rose Sparkling Wine, launched in the spring of 2014 and a preferred wine by the Italian tasters present at the venue: the white Cabernet Sauvignon, that conquered all hearts by his long lasting aroma, fine taste and technological mastery. The Feteasca Neagra (Black Girly) by Casa Panciu was undoubtedly the Queen of the festivity. After it was highly noted at Vinitaly (Italian wine contest) in March 2014 and voted by the diplomatic committee in April 2014 at Good Wine, as the Best Red Wine in 2016, it catches the eyes of all the visitors and good wine lovers. Casa Panciu had presented the celebrated national wine ilk: Feteasca Neagra in two separate editions, one under the brand of Panciu Domains (Domeniile Panciu) and one under the name of Casa Panciu (House of Panciu) both united by a perfect mastery of the tannins, a perfect maturity potential that is promising a good evolution in the bottle and will offer full enjoyment to the consumers for many years to come. The guests present on the venue, crowded to taste the Muscat Ottonel Sparkling Wine, the Best Romanian Sparkling Wine for 2015, awarded by The Institute of International Relations and Economic Cooperation the title of Diplomatic Wine, the Romanian representative wine. Congratulations are pouring for Professor Dr. Anton Caragea-IRICE General Director and Senator Ionel Agrigoroaei from organizers and visitors alike. After touring the Casa Panciu stand, Professor Dr. Anton Caragea has continued his tour, making a stopover, to review the Economic and Food Industry High School Pavilion. On this occasion the staff and students of Economic and Food Industry High School where presented to and congratulated by Professor Dr. Anton Caragea as the future specialists of Romanian food and agriculture industry. The visit to the exhibition hall continued with the discovery and promotion of Romanian quality wines, with an on the spot visit to the pavilion of Wine Research Institute from Pietroasa were had tasted the high quality wine made by researchers and university professors of the center. The unstinted offer comprised specific Romanian wine sorts like: Feteasca Neagra (Black Girly), Busuioaca de Bohotin, Feteasca Albă (White Girly),Feteasca Regala (Royal Girl) and the flag-ship wine of the Research Station: Tamaioasa Romaneasca, a wine that conquered the public with his freshness, pregnant aroma, long lasting taste, fruity flavor encompassed in an exceptional wine, appraised at 93 points. The Food and Agriculture Exhibition 2016 has proved the ever growing level of Romanian food industry and agricultural producers and the skills of Romanian wine producers, perfect represented by the Casa Panciu-the creator of Romanian Diplomatic Wine. Professor Dr. Anton Caragea-IRICE General Director and Senator Ionel Agrigoroaei are visiting the Economic High School official stand. 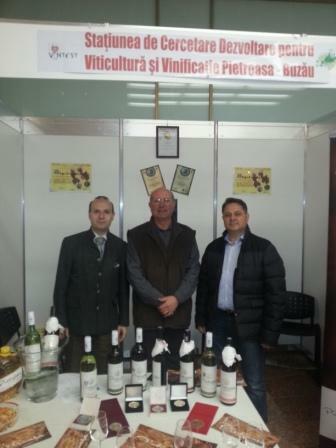 The Food and Agriculture Exhibition 2016 also illustrated the potential of Romanian wine research network by the high level presence of the Wine Research Station of Pietroasele has concluded in his assessment of the Agricultural show – October 2016, Professor Dr. Anton Caragea- President-General Director of Institute of International Relations and Economic Cooperation. The Food and Agriculture Exhibition 2016 had clearly marked a perfect opportunity for Romanian diplomacy to highlight for the world the high quality of Romanian food and agricultural industry products and to get the limelight for the traditional recipes that are transforming the Romanian food products in true symbols of perfect quality and taste, perfect for export. Venezuela and Romania are long-term partners, dedicated in building a world based on dialogue and understanding, this was the conclusion of the bilateral consultations held on 26 October 2016. 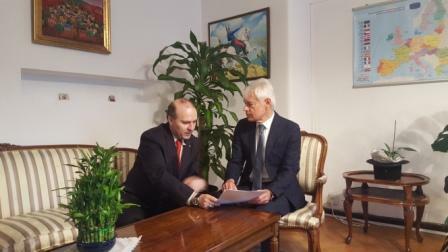 Dialogue and consultations held by H.E. Ambassador Victor Carazo and H.E. Professor Dr. Anton Caragea. The regular cooperation and consultation meeting had taken place between Prof. Dr. Anton Caragea, President Director-General of Institute of International Relations and Economic Cooperation and H.E. Victor Ramon Carazo, Ambassador of Bolivarian Republic of Venezuela. The dialogue was opened by H.E. Victor Ramon Carazo, Ambassador of Bolivarian Republic of Venezuela with a powerful presentation encompassing the latest developments in the political life of Venezuela. The ambassador presented his country efforts for peaceful dialogue and peaceful resolution of all the conflicts and made a compelling presentation of the efforts of H.E. President Nicolas Maduro in opening dialogue with the opposition. Ambassador Victor Carazo outlined also his country positions on diplomatic arena and the efforts of President Maduro to put at the same table OPEC and non-OC members in order to achieve a normalization on the oil market. Other lines of the diplomatic activities of Venezuela where also highlighted as the recent visit to the Middle East by President Maduro and the meeting with Pope Francisc who offered Catholic church mediation services in calming the internal situation on Venezuela. On his turn Prof. Dr. Anton Caragea, IRICE President outlined the latest diplomatic activities like the official visits to the Kingdom of Cambodia (June 2016) and Laos (September 2016), high level visits that opened new venues of dialogue and economic presence between Romania and Indochina region. Other diplomatic achievements were noted the creation of THE PARLIAMENTARY ASSEMBLY FOR SUSTAINABLE DEVELOPMENT GOALS, a world level initiative that is self-explanatory towards Romanian international prestige as the country is seen as a moderation and neutral force highly capable in supporting world parliaments to achieve SDG objectives of United Nations. A thoroughgoing analysis of Venezuela situation made by IRICE President, Professor Dr. Anton Caragea and Bolivarian Republic Ambassador-Victor Ramon Carazo. IRICE President, Professor Dr. Anton Caragea avail the occasion to express his amicable fillings and friendly interest towards the efforts of President Nicolas Maduro to consolidate Venezuela`s economic development and independence, open society and are creating a sense of perfect unity between the people of Venezuela and the government. In the concluding part of the diplomatic encounter, H.E. Ambassador Victor Ramon Carazo presented the latest evolutions in the frame of bilateral relations, emphasizing the numerous solidarity activities of people of Romania with Venezuela`s revolutionary evolutions and building new bridges of understanding between Romania and Venezuela. The parties had appreciated that between Romanian and Venezuela there are many common interests, designed to forge a good understanding between the two nations. The regular consultations and frank discussions between Romania and Venezuela are a constant of the diplomatic relations and are the foundations to continue the dialogue and mutual understanding between the two countries and people’s.